It’s October. For some that means pumpkins, decorative gourds, and the like [see McSweeney’s Internet Tendency]. Other people are chomping at the bit for gruesome decorations, plastic masks and the onslaught of sugar demanded of and donated by neighbors. Still others are starting to prepare for/on the verge of panic about the Impending Holiday Season. I, frankly, just need a drink. A summer’s worth of harvest and bounty has ripened and tantalized, the harvest moon has risen and set, and a myriad voices buzz about the ether urging you to grow, pick, cook and preserve. I am instead going to urge you to resist the tyranny of “busy.” Let’s all take a collective load off and ponder the least industrious of gardening topics — produce-led cocktails, or as I like to call them, the Farm-to-Wet-Bar movement. My dear friends at the beloved Flea Street Café — a gourmet and locavorous gem in Menlo Park — have lent us the brilliance of their man-at-bar Eloy, who is truly a font of all alcoholic knowledge. He has generously shared with us the makings of a perfect peach cocktail, as at ease in early autumn as it was in midsummer. I give you the brilliantly named Peaches and Herb. Muddle together the peach slices, sage leaves and bitters. Add them to a cocktail shaker with the brandy, peach brandy, Cointreau, lemon juice and plenty of ice, and go hell for leather. Strain into a martini glass, and garnish with a slice of peach and a sage leaf. Sip and enjoy. The only thing more glorious than this beauty of a drink would be to drink one made with a peach of one’s own. Once upon a time in Rome, I had the distinct pleasure of tasting the most perfect morsel that will ever pass my lips. It was late August 1998; my family was in Italy; my brother and I were arguing with our parents, who no doubt had had more than enough to do with us; I was desperate for a Marlboro Light; it was hotter than the armor on a blood-soaked gladiator. Graham and I spent our last 20 million lire on a peach from a farmer’s stall, and Holy Mother of God — our tastebuds and minds were blown. Like a junkie chasing that elusive first high, I have since searched relentlessly for a peach as sublime, never with any success. Fast forward to October 2013, and I’m much older and not particularly any wiser. I now live in a house with a garden in Northern California with a husband and two young sons, and thus the cigarettes and world travel have sadly passed me by, but I do have a peach tree of my own. Rio Oso Gem, to be exact, a particularly pleasing purchase after a 7-year stint in London and its miserable climate. families shopping at night! Aisles full of husbands! Peaches grow well in the US between zones 5 and 9; in the Mediterranean; and in China and Iran. They need full sun and quite a bit of heat and water to do their best. Their geographic range is limited by the fact that they need a certain amount of winter chill to set fruit yet can’t tolerate hard freezes. Many varieties are also susceptible to peach leaf curl and a host of other diseases and thus prefer climates low in humidity. Peach (and nectarine — same genus, different skin) blossom is show-stopping in the spring — bright pink fluff against dark leafless branches. 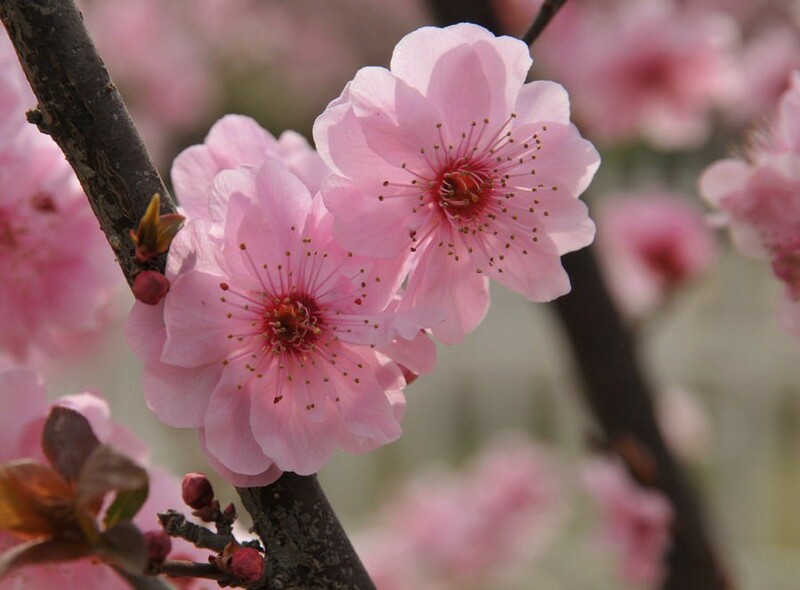 Peach blossom is prized in the Chinese tradition, signifying longevity and romance. 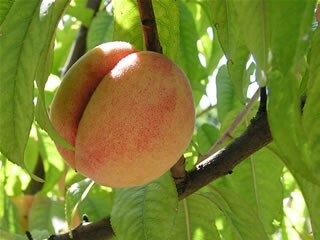 Planted in the feng shui area of Partnership within your garden, a peach tree in blossom is said to help find a soulmate. Pruning peach trees is best done while the tree is in bloom, which is slightly later than the usual dormancy of fruit tree pruning. Once blossom breaks, dead branches that have succumbed to frost damage are easily identified and removed; pruning wounds also heal faster. Ideally a peach tree should be trained to an open-vase form and kept short enough to harvest without a ladder. Summer thinning of a peach’s abundant fruit set is also recommended. (Clearly this is not something with which I have much experience.) Each peach should grow about a hand’s span apart; if they’re growing too closely together, remove the smallest fruit buds, allowing the rest to develop well and preventing the branches from breaking under a too-heavy crop. As for when to harvest, do not pick that peach if there is even the slightest drop of green in its background. Step away from the peach! Once the skin is fully red, yellow or white (or… peach), check for a bit of softness, and then twist the fruit gently upwards. Peaches bruise easily, so pull carefully. If you aren’t going to eat your peaches straight off the tree — and frankly, why wouldn’t you — chill them immediately and use them within two weeks. Alternatively, trail a hungry raccoon; they seem to have an innate aptitude for detecting perfect ripeness. If you live in a low-chill (warm-winter) climate, try growing Babcock or Rio Grande. If you live in a cold climate, try Harbelle, Reliance or Polly White. If you live in the Deep South or somewhere equally humid, try La Feliciana. If you live in Northern Europe, visit Rome as soon as possible. Their peaches will haunt you for life. The guru of peach farming is David Masumoto, of Masumoto Family Farm. His family’s new cookbook, The Perfect Peach, was recently released by Ten Speed Press; I can recommend no peach book more highly. 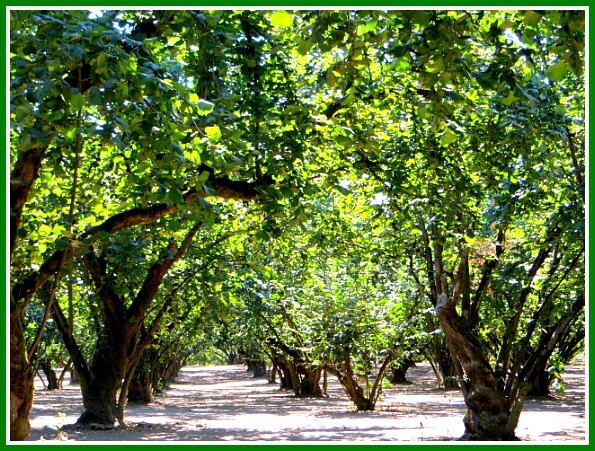 Also read his beautiful memoir Epitaph for a Peach: Four Seasons on My Family Farm. For further advice on growing edibles, there is none more knowledgeable or articulate than Rosalind Creasy. You must own Edible Landscaping, now in its second edition. To learn more about pruning, look no further than The Pruning Book, by Lee Reich. These would all be perfectly delicious to read while sipping a Peaches and Herb, thinking fondly of Eloy and Jesse at Flea Street, and plotting revenge on the urban scavengers of the neighborhood, be they raccoons or trick-or-treaters. Happy October.